This year was the first year we successfully grew tomatoes. In the high mountains I call home, frost usually makes its last appearance in June and its first appearance in early September, leaving me only a short window in which to successfully tend a garden. While we managed a few ripe Sungold tomatoes, when the frost threatened only green tomatoes hung on my carefully tended vines. I usually dredge my green tomatoes in cornmeal, and fry them in home-rendered lard, but this year we had baskets of green tomatoes, an overabundance of hot peppers and very little time. So I pulled out my favorite fermentation crock, and set to work making Green Tomato and Hot Pepper Pickles the old-fashioned way: with nothing more than salt and time to aid their pickling. Fermentation is my favorite way to preserve the bounty of summer and autumn for use in the dark days of winter. As spring rolls to summer, and summer to autumn, the boxes of produce we receive from our local farm grow larger and larger. And, for a time, the farm delivers far more produce than my little family of three can eat in a single week. I hate to let it go to waste, so I preserve what I can. I dry fruit in our dehydrator. I make Super Green Veggie Powder and Spiced Peach Butter. And I make mountains of Apple Pear Sauce. But fermentation is my favorite way to preserve the harvest, and I work my way through mountains of cabbage for sauerkraut, gallons of cucumbers for sour pickles and, this year, pounds of hot peppers and green tomatoes for these pickles. Like Sour Pickles and Pickled Peperoncini, I rely on a saltwater brine and a good old-fashioned fermentation crock to pickle green tomatoes and hot peppers. Unlike preparing vinegar pickles, fermentation requires no heat, no canning, just a simple brine and time. This combination creates the opportune environment for beneficial bacteria to take root, populate the crock and to eat away at the sugars in the vegetables. As they consume the carbohydrates found in these vegetables, they also produce vitamins, particularly B vitamins, as well as lactic acid which accounts for the sour flavor of naturally fermented foods. As a result, these fermented food not only retain the heat-sensitive vitamins and food enzymes found in raw foods, but also they see an increase in vitamins and they become an excellent source of probiotics – just like yogurt, kefir or other traditionally fermented foods. Fermentation is an anaerobic process, though beneficial bacteria can grow in both oxygen-rich and oxygen-deprived atmospheres. Using a crock designed for fermentation helps to ensure that you create the optimal environment for the proliferation of beneficial bacteria, while also limiting chances of contamination by stray microbes like molds. These crocks as well as other jars that are designed to keep an airtight environment can help prevent the contamination of your ferment by stray microbes; however, if money’s tight, keep in mind that you can still successfully ferment your foods in mason jars or other open crocks that do not keep an airtight seal. You will need to watch them for signs of contamination which can include the build up of mold on top of the ferment, stray colors or slimy texture. The other trick is to always make sure that the vegetables you are fermenting remain completely submerged in brine – either a brine made of salt and water as used in this recipe for Fermented Green Tomatoes, or a brine made of salt and vegetable juices released by the vegetables themselves as in Sauerkraut. 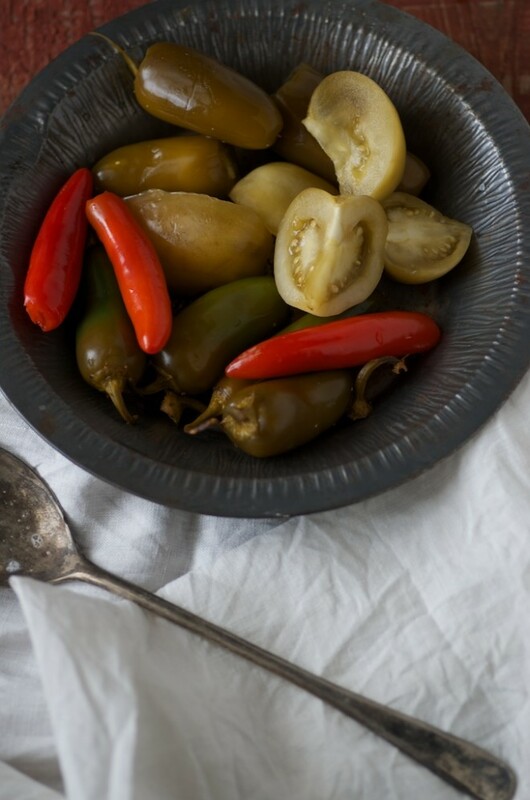 Pickled the old-fashioned way, through fermentation, these Green Tomatoes and Hot Peppers are delightfully spicy, pleasantly sour and a charming treat for winter time. Warm 2 quarts of water on the stove until it reaches about 100 F, whisk in the salt and allow it to dissolve in the warm water to create a brine Set the saltwater brine aside, and allow it to cool until it reaches room temperature. While the saltwater brine cools, take a sharp utility knife (this is my set) and quarter the green tomatoes. Place them into a 5 liter fermentation crock (this is the one I use). Next, add drop the hot peppers into the crock, trimming away the stems if they're hard or dried out. Peel the cloves from the heads of garlic, and drop them in the crock. Take a wooden spoon and gently stir the vegetables in the pot so that they're more uniformly dispersed in the crock. Pour the brine into the crock so that it covers the vegetables. If it doesn't, simply add more water until the vegetables are completely submerged. Weigh the pickles down with stoneware weights (these fit 5-liter crocks), place the lid on the crock and fill the well with water to create a seal. Allow the green tomatoes and hot peppers to ferment for 14 days, checking the well of the crock periodically to ensure it remains full of water and the seal remains intact. After 14 days, open the crock and taste the pickles. If you prefer a more pronounced sour flavor, continue to allow the vegetables to ferment, tasting them once a week until they achieve a level of sourness you prefer. Transfer the fermented green tomatoes to jars and store them in a cool, but not freezing, place such as a refrigerator, root cellar, exterior closet or garage. Fermented green tomato pickles will keep for at least 9 months and up to 1 year, that is if you don't eat them up sooner. This post contains affiliate links. When you make a purchase through the links listed above, Nourished Kitchen will earn a small commission that helps to maintain and grow this site. To do this in mason jars, just disperse the veggies evenly among jars and add liquid? No weight stones? If you do it in mason jars, I’d recommend tossing all the veggies into a big bowl first then stirring them to mix them up a bit. Then you can easily add the veggies to the jars, pour the brine over. No need for whey in this, but do make sure the vegetables are kept completely submerged under the brine while allowing 1-inch headspace in the jar. A weight, of some sort, would help because the peppers tend to float and you don’t want them exposed to air. So, if I do them in mason jars (don’t have a fermentation crock), do I then just store them in the fridge or do I leave them out a few days (or 14 days)? I made the kimchi in a plastic bucket with a stone from my garden and it turned out amazing! I have eaten almost all of it (all by myself because hubby won’t touch the stinky stuff) and will have to make more soon. I wonder if tomatillos would work….all my tomatoes turned red. Tomatillos would work wonderfully. I’ve pickled them as well for years. Though I usually have to fight to pickle them since all the boys in my life love salsa verde! I’ve never really tried pickling before. I just want to say I learned a lot from this post, enough to get me interested in trying to ferment food in my own kitchen. Thanks for this. What an inspiring post! I already put all my green tomatoes in the freezer, thinking I’d turn them into chutney one dark winter day. Do you know if this would work if the tomatoes had been previously frozen, or would freezing have killed off some of the little helpers that kick off fermentation? I have an assortment of sweet and hot peppers that i picked before our first frost last week. Do sweet peppers ferment well too? I have a 5L crock and would like to just ferment everything together. So far i have only fermented kraut a couple of times (which is awesome) — so i am not as confident as i would like with fermenting yet. Also i have contemplated chili sauce. Can i ferment the peppers whole first (using the caldwells starter), then grind and strain some for chili sauce later? After fermentation do I just pack the tomatoes in mason jar or are the peppers also included? My grandfather and my dad layered peppers then green tomatoes then unionized salt in a 5 gallon crock. Covered with a round piece of wood with a hole in the center, then a large smooth stone for weight. Cheesecloth on top. This was kept in a cold basement room all fall. At Christmas, he scooped a portion out and rinsed in a Callender . Then, he fried this in olive oil. My eyes burned. We kept this in a mayonnaise jar had with Italian bread with every meal. I’m salivating! . We called it Zaliata!! I still have the large crock mom and dad used. Manga!!! Here is a recipe something like this that i got years ago from on old Italian lady in her 90s. In a large crock ( we use a 10 gal.) chop up and layer green tomatoes, peeled and chopped eggplant, green hot wax peppers before they turn red and 1/2 cup sliced garlic. Sprinkle over this 1 heaping tsp. white pepper,1 heaping Tbls. Italian seasonings and 3 Tbls. canning salt. Press lightly, then repeat the layers till the crock in almost full. Put on your wooden plate, then a clean heavy stone. Press lightly till the liquid cover all the veggies. Cover with cheese cloth, put in a cool place and let ferment for 6 to 8 weeks. Then drain all liquids but don’t rinse. in a large bowl mix all the mix with veg. oil, mix well. In sterilized jars add a little oil then the mix, top off with oil and put on the sterilized lids. Store in a cool place and enjoy. 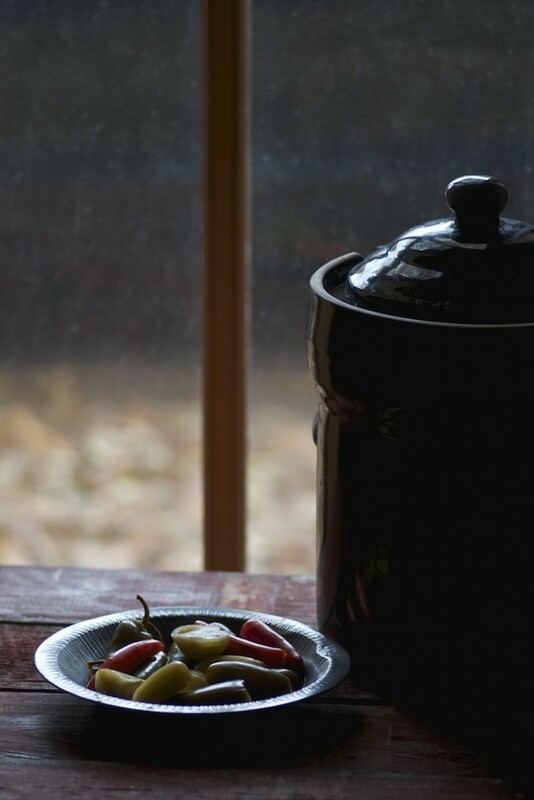 Hi Jenny – I ferment regularly and loved the idea of using up some green tomatoes and peppers from my garden. Thank you for this brilliant recipe. I am one week on the fermentation ( using crock with stone ) it has been burping away and I wanted to take a peek since it is still pretty hot here. Well there is quite a white film on top with huge bubbles. I know the peppers can create a milky film but thought I should check in with you. What do you think? Normal? Let it go for another week? Thank you? I use two 5 liter german crocks with a water seal and stones, a really good investment, already on its 20th ferment. Best results that seem to never fail are sriracha using garden grown modestly hot peppers, like Beaver Dam, Anaheim, Poblano, Fresno Chili, Cherry bomb. No Jalapeno or habanero or hotter peppers, so there is heat but incredible flavors. Based on this history, my reply. First, the milky film is mold, indicating there was oxygen present during the fermenting. I suggest using two cabbage leaves cut to the size of the pot to cover the fermenting veg, anchored with the two stones. Second, I use four squirts of an inert gas at the start. It is available in wine shops, designed to put a heavy non-oxygen blanket on a partially drunk bottle of wine, allowing it to store for several days. This pushes out the oxygen, gives the fermenting process some time to start and produce CO2, which will push out the oxygen. If you want to look or stir, then use the inert gas again. I still see some mold, that I skim off, but it is greatly reduced. The material can keep fermenting, as the brine and lactic acid protect against the bad organisms, deepens the flavor. My appreciation of this site is the focus on lactic acid fermenting. Most recipes call for vinegar and then heating up the mixture, which kills all of the bacteria and the benefits of probiotics in our diets. The end result is called ‘pickles’, but is acetic acid from the vinegar, and has little to no biologic life. 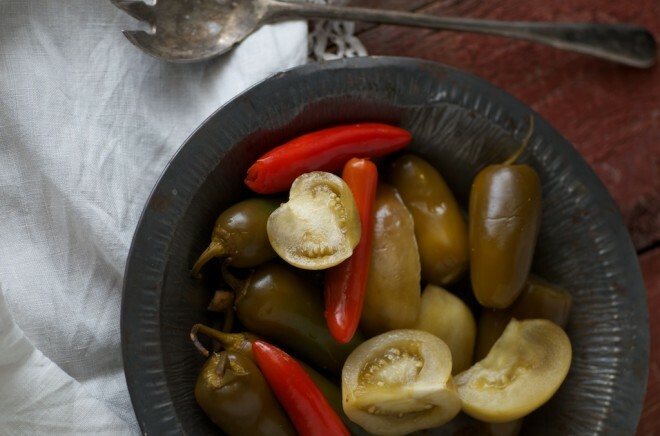 Have you ever made these without the peppers? I am looking for a recipe like the ‘stinky’ green tomatoes I ate as a child. They were from a local Jewish deli and they were delicious! Tried your tomatoes and pepper they were grate ive got to put up more before the garden is gone. THANKS. Yes I have the same question as James! What do I do when the tomatoes are ready for jars? Do they go directly in the jars with original brine? Do they need to be rinsed? Should I mix up new brine for the jars? Should I add new garlic, dispose of garlic or put original garlic in the jars? Thanks! So we had to travel after starting the fermentation process. We dont have a fermentation crock on hand so we decided to ferment in a stsinless stock pot. We weighted the veggies down (just green tomatos) sealed the pot with aluminum foil, covered, and stored. I just opened them and notice the brine was slimy and there was mold on the top. I took a small taste of the brine and it tasted fine (saurkraut flavor). I know there are good molds (think cheese) and bad molds (think black mold). I strained off the mold but am wondering if the tomatoes will still be ok to eat or will people get sick? I have a feeling they should be fine as they dont taste rancid, but I want to know what you think. Hi Tim, I wouldn’t eat it or serve it to guests as a slimy texture is not a good sign.